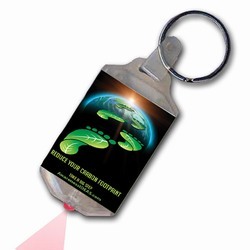 Theme: Two footprints emphasize the importance of knowing about and adjusting your carbon footprint. The poster includes a full explanation of what a carbon foot print is and how you can improve yours. 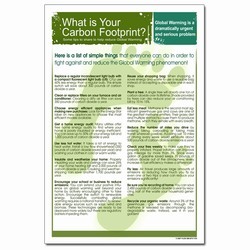 Message: "What is Your Carbon Footprint? Global Warming is a dramatically urgent and serious problem. Some tips to share to help reduce Global Warming. Here is a list of simple things that everyone can do in order to fight against and reduce the Global Warming phenomenon! Replace a regular incandescent light bulb with a compact fluorescent light bulb (cfl): CFLs use 60% less energy than a regular bulb. This simple switch will save about 300 pounds of carbon dioxide a year. Clean or replace filters on your furnace and air conditioner: Cleaning a dirty air filter can save 350 pounds of carbon dioxide a year. Choose energy efficient appliances when making new purchases: Look for the Energy Star label on new appliances to choose the most efficient models available. Get a home energy audit: Many utilities offer free home energy audits to find where your home is poorly insulated or energy inefficient. 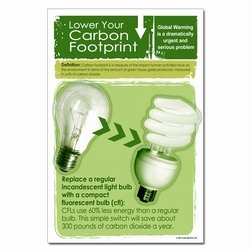 You can save up to 30% off your energy bill and 1,000 pounds of carbon dioxide a year. Use less hot water: It takes a lot of energy to heat water. Install a low flow showerhead (350 pounds of carbon dioxide saved per year) and washing your clothes in cold or warm water. Insulate and weatherize your home: Properly insulating your walls and ceilings can save 25% of your home heating bill and 2,000 pounds of carbon dioxide a year. Caulking and weather-stripping can save another 1,700 pounds per year. 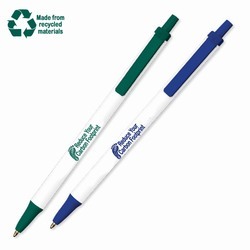 Be sure you’re recycling at home: You can save 2,400 pounds of carbon dioxide a year by recycling half of the waste your household generates. Recycle your organic waste: Around 3% of the greenhouse gas emissions through the methane is released by decomposing bio-degradable waste. Instead, use it in your garden! Reuse your shopping bag: When shopping, it saves energy and waste to use a reusable bag instead of accepting a disposable one in each shop. Plant a tree: A single tree will absorb one ton of carbon dioxide over its lifetime. Shade provided by trees can also reduce your air conditioning bill by 10 to 15%. Eat less meat: Methane is the second most significant greenhouse gas and cows are one of the greatest methane emitters. Their grassy diet and multiple stomachs cause them to produce methane, which they exhale with every breath. Reduce the number of miles you drive by walking, biking, carpooling or taking mass transit wherever possible. 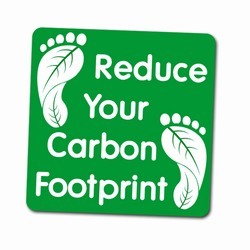 Avoiding just 10 miles of driving every week would eliminate about 500 pounds of carbon dioxide emissions a year! Check your tires weekly to make sure they’re properly inflated. Proper inflation can improve gas mileage by more than 3%. Since every gallon of gasoline saved keeps 20 pounds of carbon dioxide out of the atmosphere, every increase in fuel efficiency makes a difference! Fly less: Air travel produces large amounts of emissions so reducing how much you fly by even one or two trips a year can reduce your emissions significantly! 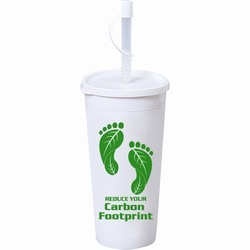 Encourage your school or business to reduce emissions: You can extend your positive influence on global warming well beyond your home by actively encouraging other to take action. Encourage the switch to renewable energy. Successfully combating global warming requires a national transition to renewable energy sources such as solar, wind and biomass. These technologies are ready to be deployed more widely but there are regulatory barriers impeding them.